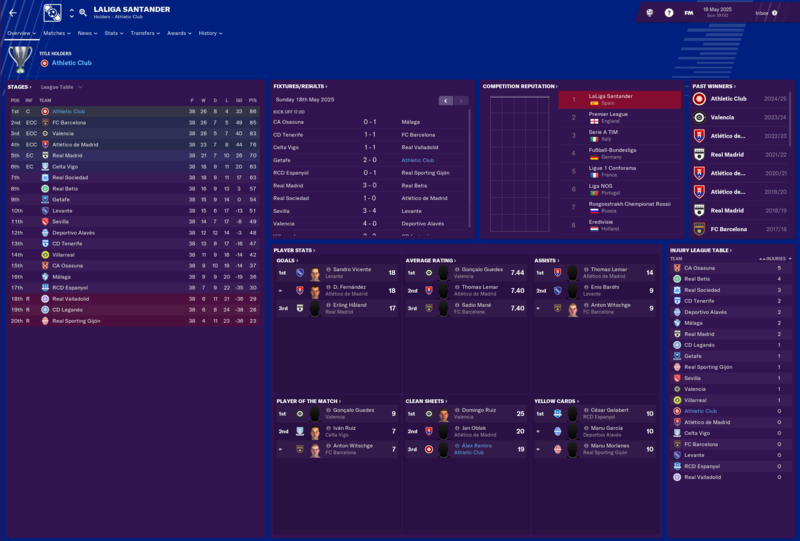 I accidentally didn't include segunda division B when I loaded the game (assumed it would just be included with Spain) and I'm only in my 2nd season but they are near the top of their league. How long did it take to get them promoted? Think I would do the same as you if/when they get promoted, well that's the plan anyway as per my point about determination, I'm hoping to create a highly determined squad right the way through. I have noticed the same thing regarding individual training for B team players! Maybe it's supposed to be like that. 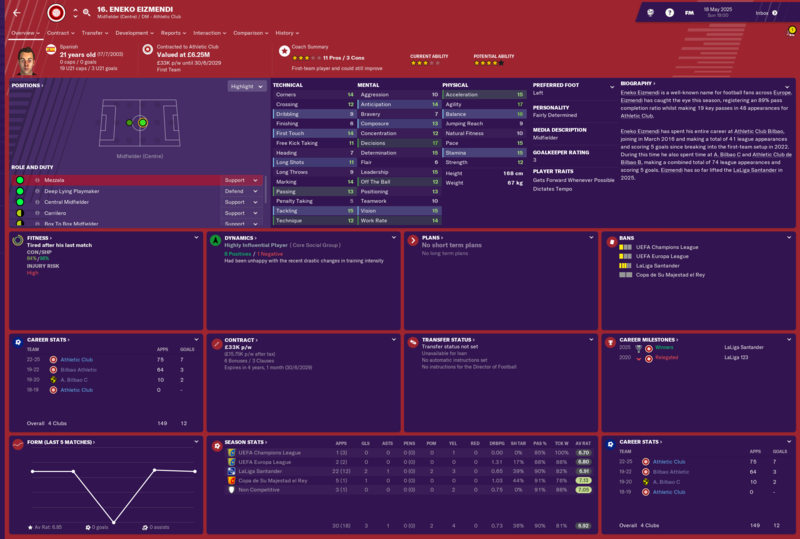 I just got a player in my youth intake which my head of youth developement thinks could emerge as one of the best players of his generation. He has 4 gold and a half black star PA. Any experience on these? 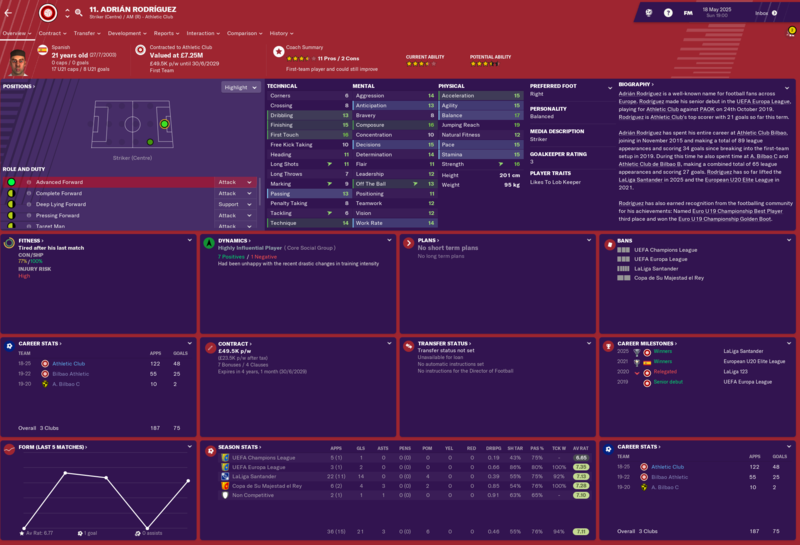 I just got a player in my youth intake which my head of youth developement thinks could emerge as one of the best players of his generation. He has 4 gold and a half black star. Any experience on these? He has four gold stars ALREADY (or have I misread?) Jeez, I don't think I've had anyone with more than two gold stars with five star potential. Also, is it a bad idea with Athletic Club to have a foreign HoYD? 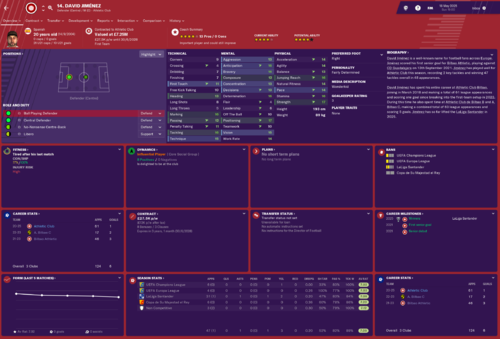 I've had Nuno Gomes and Per Mertesacker and both have great stats (better than their Spanish equivalents) but are finding 3-4 potential players. 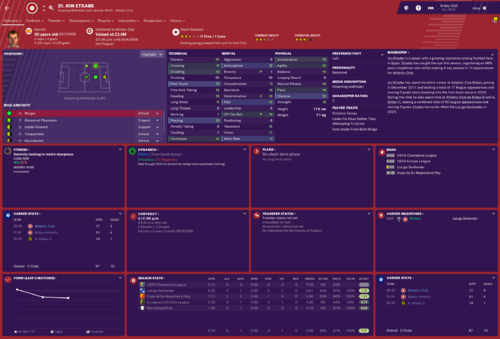 I haven't had a great 15/16yo for a few years now. Of course I doubt Spain is listed as one of their stronger countries. Sorry PA, edited it now. I have no idea if it matters, I have a dutch one. 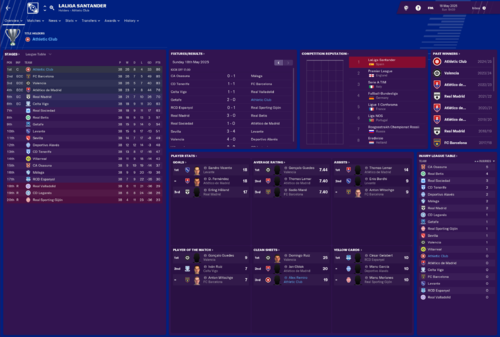 2024-2025 update: for much of the season it was a one horse race (Barcelona) and a three way fight for 2nd-4th between Atletico Madrid, Valencia and us. Valencia have really come on recently. Real Madrid were never contenders. They really haven't redeveloped their squad at all. I was content with a CL place but for some reasons the stars began to align as we won seven on the trot as the fixture gods had nicely given us some very winnable games and none against our rivals. Barcelona dropped a few points and suddenly as we went into the last game we were 2pts ahead but with a better head-to-head record so I knew a draw would be enough to deliver the title. Cue a 2-0 away defeat to Getafe....but then the players starting celebrating on the podium as Barcelona could only manage a 1-1 away draw to Tenerife. Phew!!!! It always amuses me how you can win trophies without having standout performers. The defence and attackers racked up 7s easily, but none of the midfielders did. We're developing a nice young squad now. Inigo Martinez and Muniain might be moved on this Summer. Look at David Jimenez if you want to know why!nThey both have a year left on their deals but maybe I'll keep them in reserve. 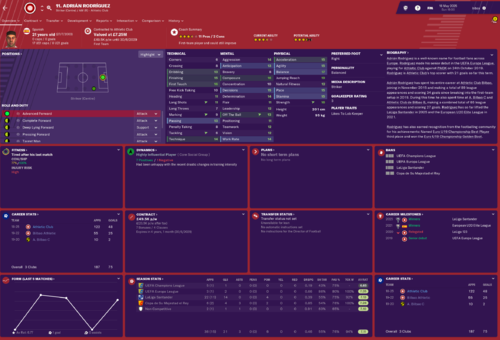 Eizmendi and Rodriguez are two promising deep lying playmakers that I alternate around Merino/Sancet. Etxabe has been converted from an AMC to an AML and is the reason Muniain might move on as I have Barrenetxea as first choice. Adrian Rodriguez is a quality striker though we could do with backup. The B team has great potential. I'll just pick a couple out. Seguin, an attacking RB, came from Sociedad. 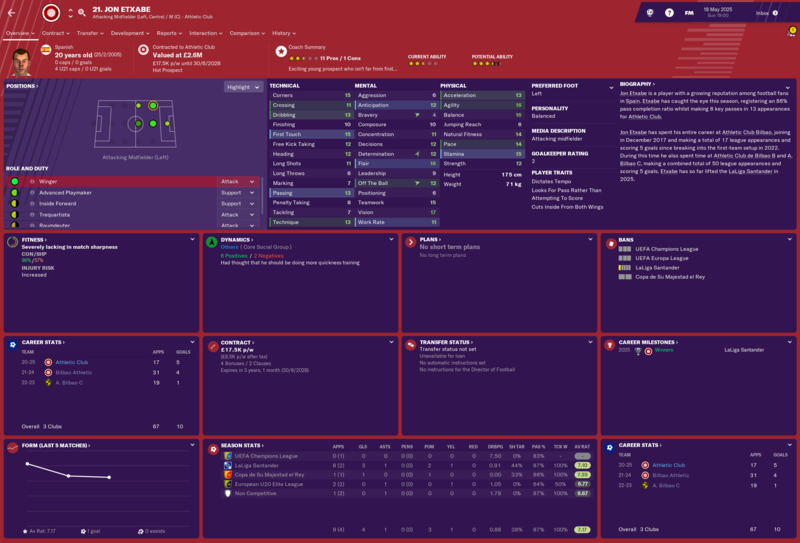 I might leave him one more season. 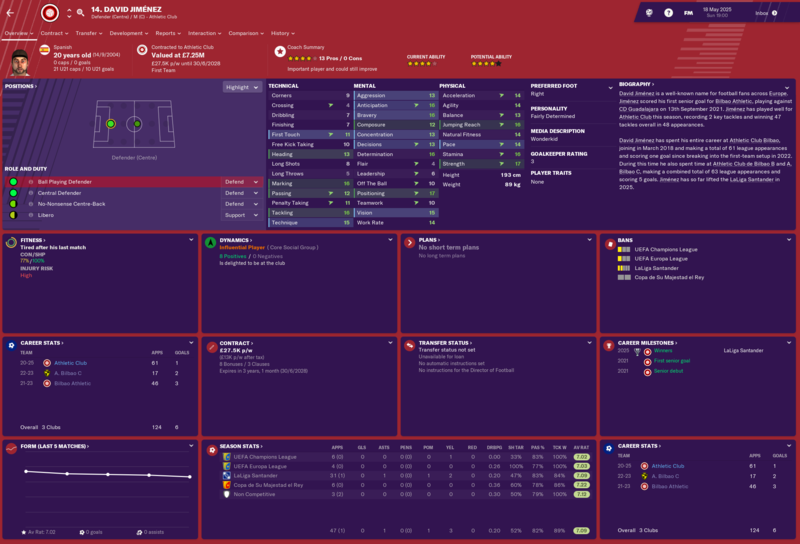 Unai Martinez is a wonderkid AMR and he might move up this Summer. And Koldo Martinez adds to our embarrassment of riches on the other flank. 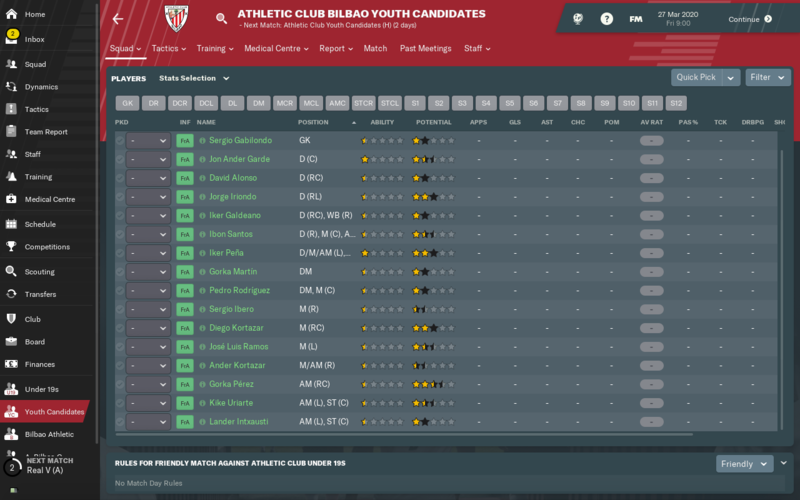 There are a few Basque wonderkids knocking around that I've been unable to nab, but that would be greedy right? Yeah I’ve had quite a few ‘best of their generation’ guys over the years. Likely they will become a world class player. Once they develop their knowledge of the area it shouldn’t be an issue, I never really had concerns about this myself having always used Bernhard Peters in past FM’s and never seeing any disadvantage. 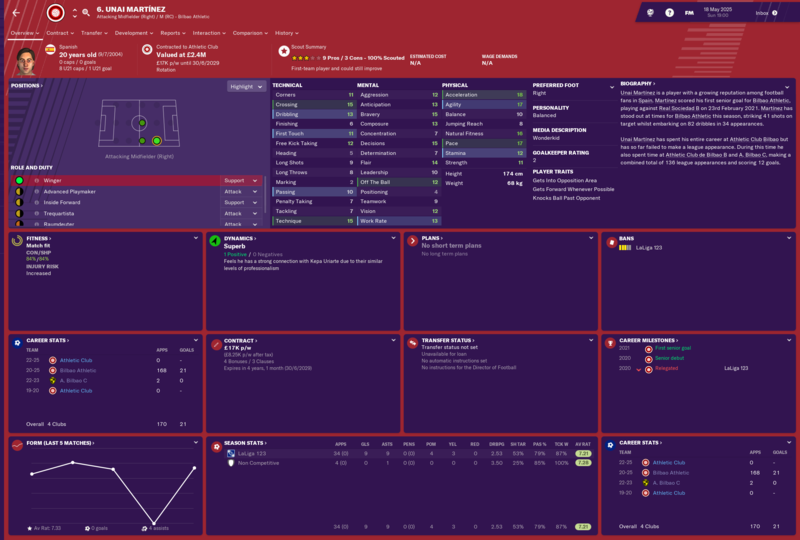 If you’re only bringing in 3-4 players in your youth intake I think that’s a database size thing. Congratulations on the league win! Some good prospects there too, the future is bright. just starting the next season, 2 for 2 in the league and we won the Supercopa against Villarreal so a positive start. Has anyone witnessed a C team promotion? 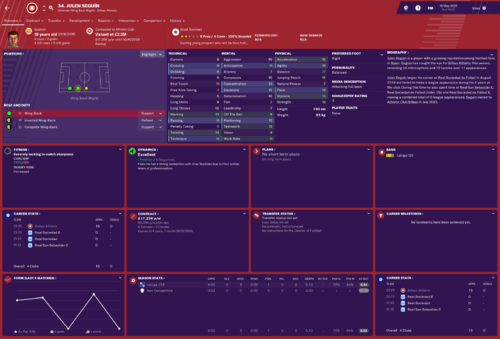 I am into my 5th season now my B team finishes in the top 3 of second division and the C team has some decent players for that level but never seen it happen. I use the star system by the way a youngster whose CA reaches 2 stars moves up to the B team, B team players whose CA reaches 2.5 stars moves up to the A team but plays with the B team if there is no squad place. I accept loan offers if the offering team is on an upper level. 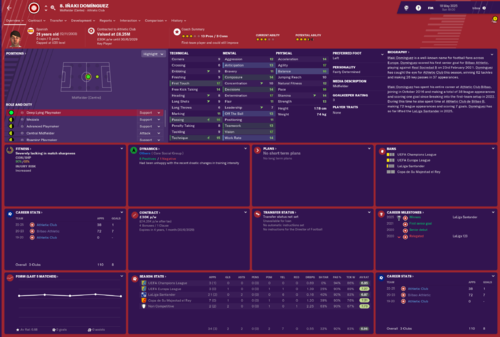 Now in the 5th season and C team has full of 1.5 stars players (incl Nico Williams) but they just cant win a promotion. 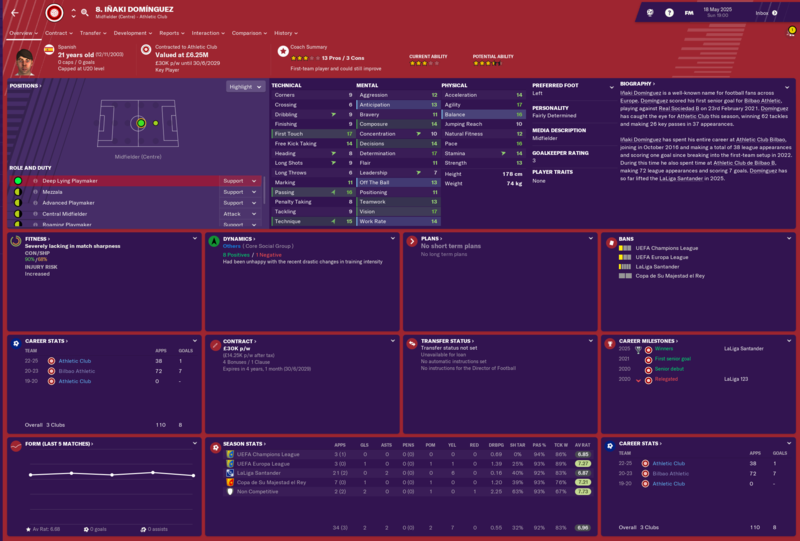 I am very proud to announce the signing of a 31 year old ANTOINE GRIEZMANN! We got Griezmann for Merino and 15M€. To lower his wages to 450K€ Athletic Club gave him a signing on fee of 25M€! Now we push for the title! 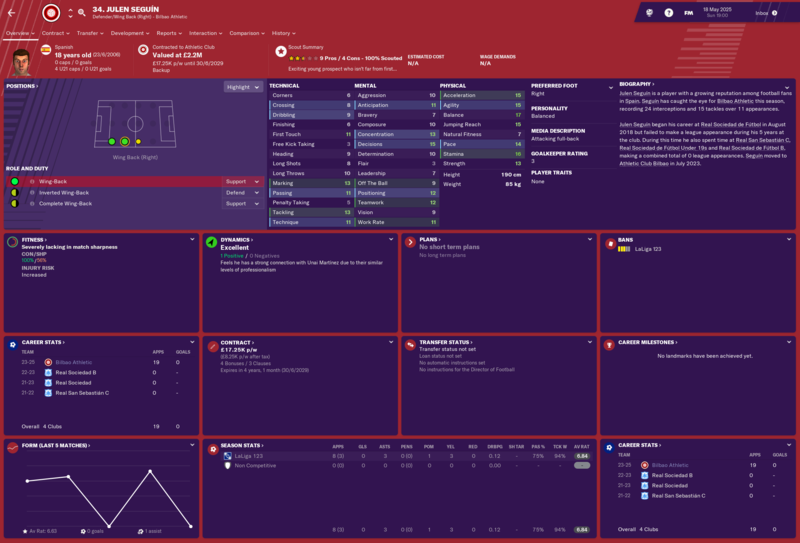 It was basically a no brainer for me, having tracked him for years with no luck to finally get him, he still has the quality I need in a title push! 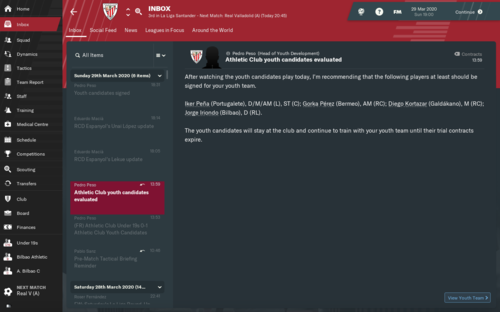 HoYD: Iker Pena is one of the better players from this year's youth intake! Me: ....so it's a **** intake then? Yeah my next thought was to go and scout all the newgens. My first intake was pretty special so can't be too disappointed. 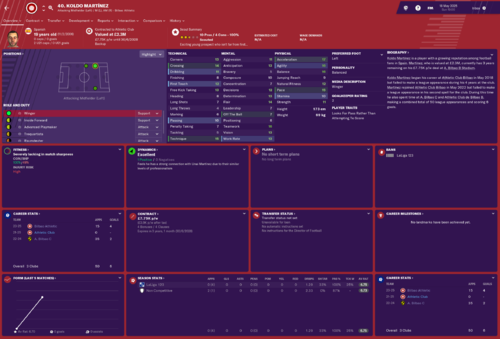 What I have noticed though is that the other clubs seem to only get 3-4 players in their intakes, yet I have a large database - why would they not be bigger if I only have a few leagues loaded? Thanks very much for the reply i appreciate it. I already started and picked all of Spain and France and top league in Germany, England,Portugal, Brazil and Italy. I will maybe remove one of them and add Mexico as computer is really stretched as it is. 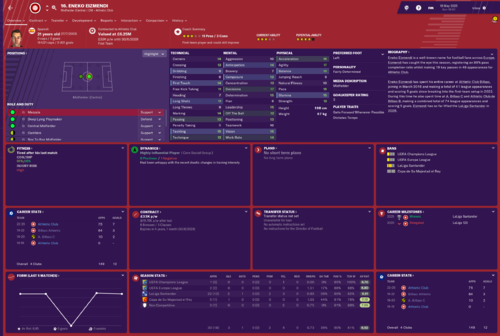 Mind that Uruguayan players that had Basque nationalities are not Basque anymore in the latest update. I have a question. 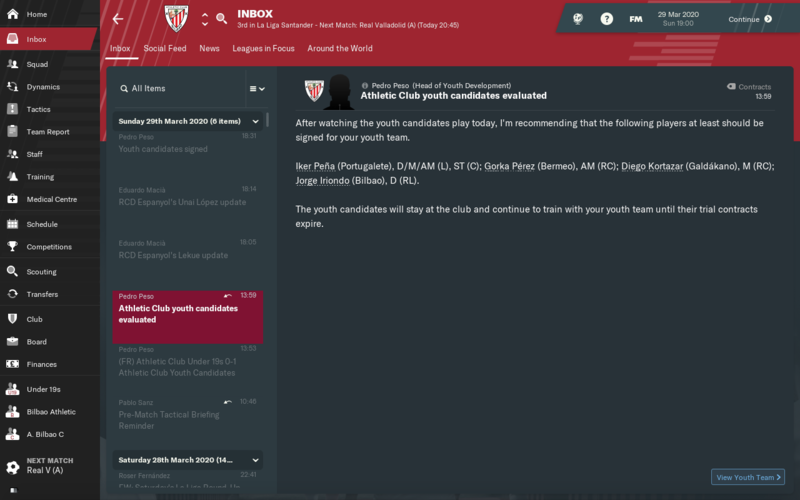 I look into all French newgens if they have a Basque nationality on the French intake day from world/europe/transfers/youth intake (you can find a French-Basque one in every 4 or 5 years). Does that screen show all the newgens for the nation or should I scan all French clubs for it? As far as I'm aware, the nation filter is only for filtering by clubs in that country rather than nationality of the newgen. So you have to trawl through the French club intakes to find Basque players. No easy way really that I know but Aviron Bayonnais are Basque and I think there is a Biarritz team but they are both small clubs but worth check their players out just in case. As an aside, Aviron Bayonnais always interest me because I feel like there would be a good opportunity to make them a big club as there are no big clubs in the French Basque country. The only problem is they start in a non-playable league (although they got promoted in my save). I think it would be a good challenge to make them a big club and try to increase the size and quality of the Basque talent pool. 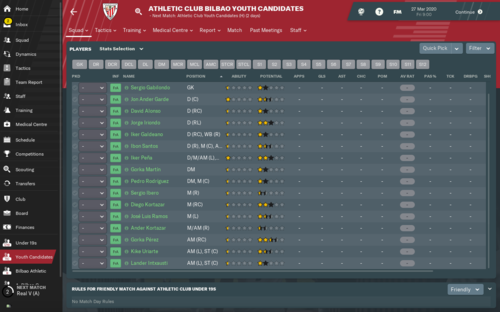 Once you've made them a force, move to Bilbao and reap the benefits. I reckon the challenge could be made harder if you follow a Basque only policy with them as well. Sacked a load of staff so need to replace them, anyone know of a good assistant manager ? best I've seen that will come to me used to play for Athletic, Roberto Rios. He has perfect personality and media style to do press conferences for me, good motivation 16, and decent discipline 15, but determination 13, JPA 13 and JPP 12. I'd do it manually through player search. 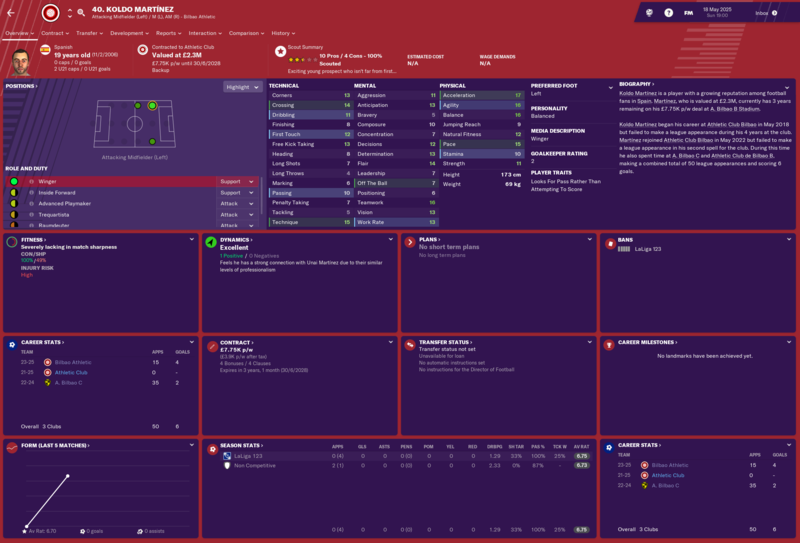 Make sure you've got a youth scouting package that covers France, untick the "realistic transfer / realistic loan" boxes, search "nationality - partially - French" and "nationality - partially - Basque" and put an age limit on it, i.e. 18. Then just highlight them all (there won't be many) and scout them. I'd do similar for Spanish ones too, just to check for the odd one that pops up outside of the Basque clubs. I don't bother about JPA / JPP if I have a good coach for it (or just set my HoYD to do coach reports). I search only using nationality Basque. Is that any different than searching nationality partially Basque? Well searching partially brings up secondary nationalities. I noticed when I manage in Italy with the complicated nEU rules, I can search nationality - is - Italian and I only get guys with Italian as their primary / only nationality. If I put it partially, I get guys with Italian as a second nationality. So if I was searching for Basques, I would always put partially just in case. Then if I was specifically looking for French Basques as opposed to the more common Spanish variant, I would add in nationality - partially - French too. I don't know if it makes a difference or not as Basque nationality works different in search, as its only available if you manage a Basque club and never appears as a primary nationality anyway.